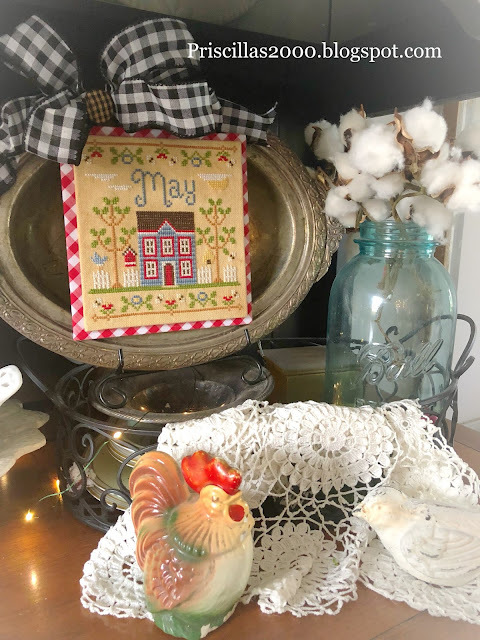 I stitched all the Country Cottage Needleworks cottage of the month a couple years ago .. a couple months ago I decided my display of them needed to change ..so I used this #oldandcrusty silver tray to mount them on with magnets and washers..I added some red gingham to the back of the stitched piece and love it so much ..It is all ready for all the patriotic decor that will be going up! This is Chelsea's Lizzie Kate May .. we had mounted April last month on this little hanging chalkboard and of course used magnets and sheet metal to switch it out.. The colors of the letters were coral and she changed that to Classic Colorworks Old Blue Jeans ..the green was baby spinach from Gentle arts ... I stitched mine in these colors last year and we both wanted the blue because soon we will be decorating with all our patriotic pieces! 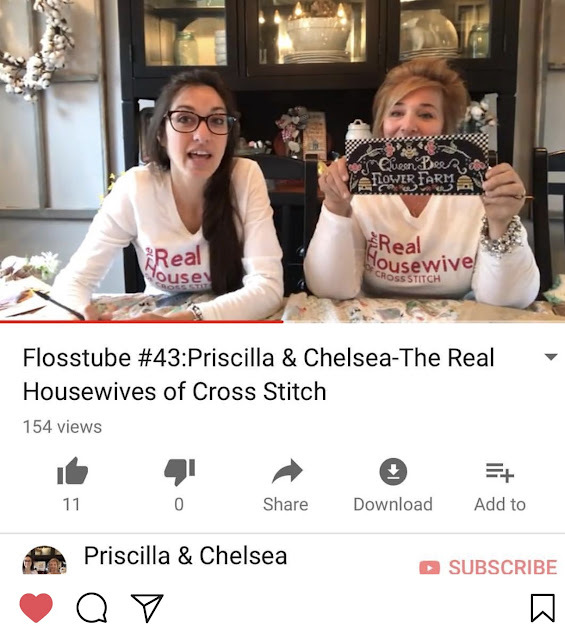 Did you check out our flosstube video for this week yet ? there is a sneak peek of the new Chalk on the Farm ..Queen Bee Flower Farm...my chalkboard to cross stitch collaboration with Hands On Design ... The rest of the design will be revealed this week .. so if you love it get on a list with your shops! They will be getting all the info tomorrow! We are having a stitch along with the hashtag #pcqueenbee .. 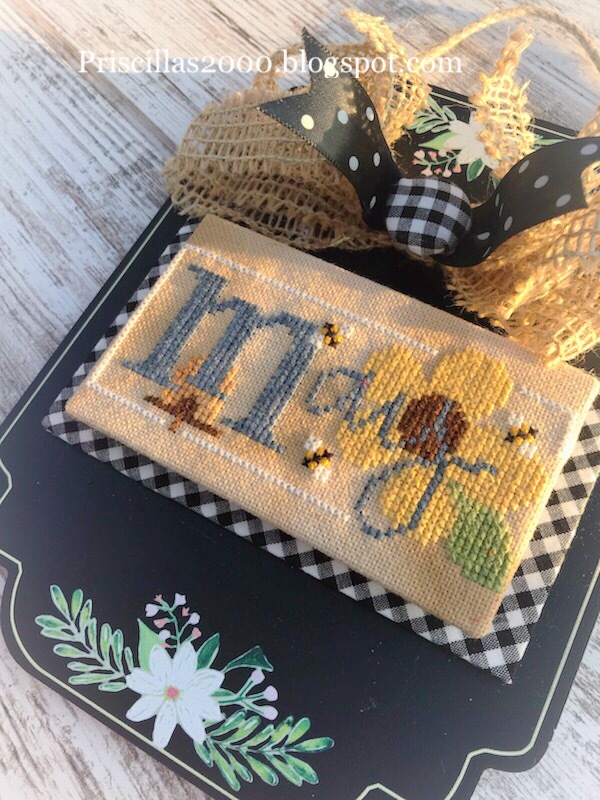 Cute little May pieces and I cannot believe Memorial Day is here in a couple of weeks, with Summer right around the corner! Love Love you guys, thank you for your inspiration. So much to do & so little time, my son is getting married memorial day weekend & lots of family coming into town. Love the red check behind the little house ~ so perfect for going into summer! 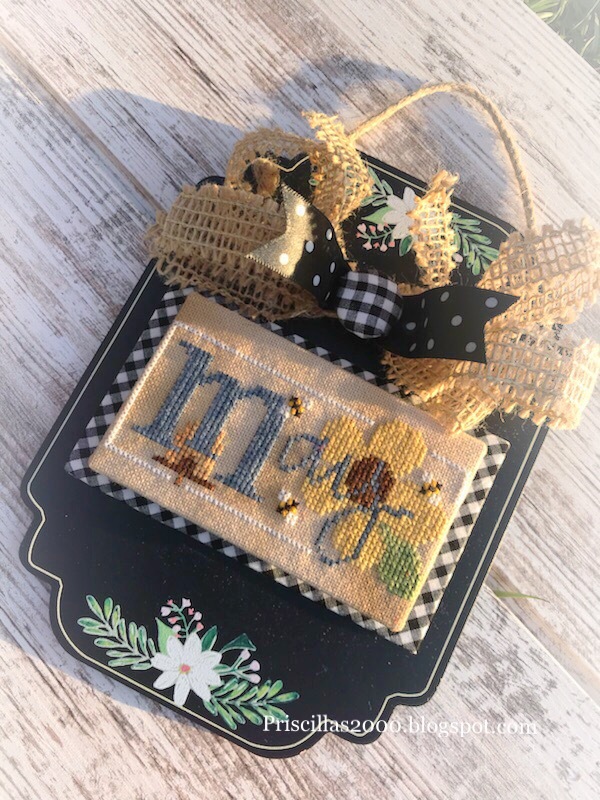 Thank you so much for taking the time to post and share pics of what you finish. It's great inspiration so it is truly appreciated!